Well, we have returned from our trip to a cold Broome! Although we are still experiencing 30c/86f in the day we have had an overnight temperature of 8c/46f and that is just to all let you know that the tropical north of Australia does have its cold moments and we do sometimes need a layer or two on! We have been used to wearing an extra layer or three over the past three weeks as we had our holiday in the Southern Highlands. Before we headed off to the Southern Highlands we had a few days in Sydney with my sister and family and took advantage of exploring the bush in search of a bird or two. Whenever we head for a city we go in search of bush and generally do not go into the city itself. In Perth we always head for Herdsman Lake and last year when we flew into Brisbane we never made it into the city, but explored the coast and the forests in search of birds before wandering aimlessly around the southern half of Queensland. 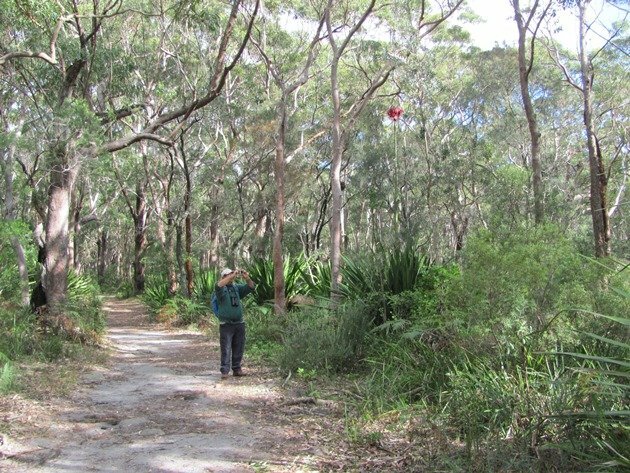 The most useful resource we have found for finding a trail to go birding along in the Sydney area is one called “wildwalks” and it is particularly good because it offers a wide range of walks of varying lengths and also using public transport. It is accurate in the estimated length of time it takes to do the walks and allows for you to stop and bird or rest and still reach your destination in the estimated time. The track maps and notes are printable and informative and we have not had any problems using them. 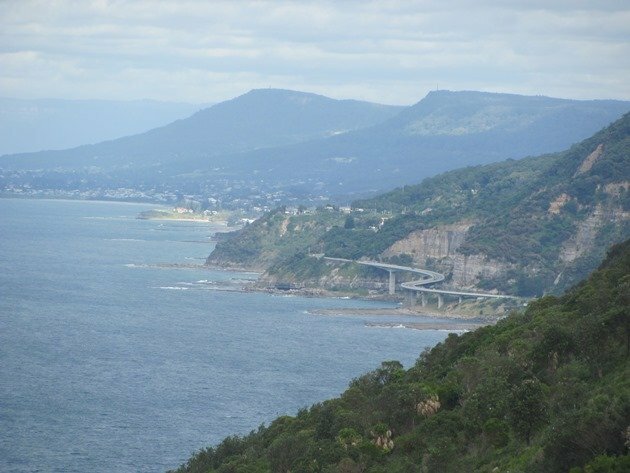 On this particular occasion just after we arrived in Sydney we decided to walk the trail from Otford train station to Helensburgh train station, which takes you through part of the Royal National Park. All train tickets in Sydney are cheaper after 9am and a day return currently costs $9.20. As soon as we got off the train at Otford we were welcomed by a Wedge-tailed Eagle flying over and an extremely vocal Eastern Whipbird. The train station is in a valley and you climb up the hill via stone steps and then follow the trail, which brings you out on the Coast track. 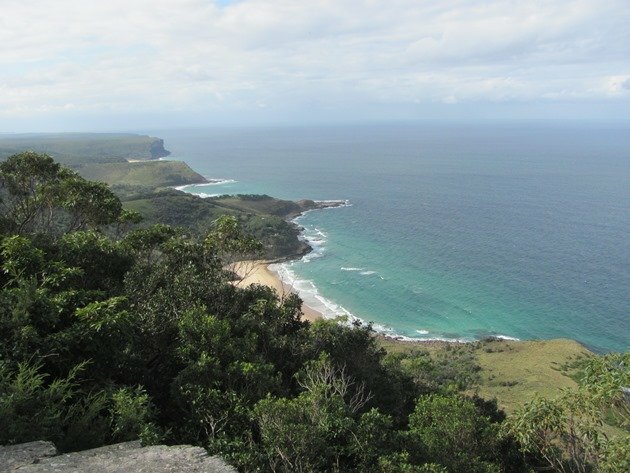 The view both north and south is spectacular and exactly two weeks after we walked this coastal area we drove the Grand Pacific Highway back to Sydney from the Southern Highlands and experienced it all over again by car. 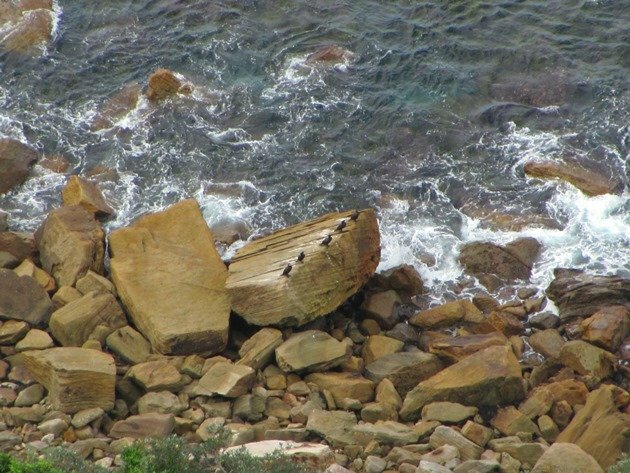 As you wander along the coastal area you need to remember to look down over the edge and look out for the bird-life on a lower level. We observed Great Cormorants roosting along the coast, Australian Gannets soaring just above the waves and of course Silver Gulls. There are a few spots where you can sit out on the rocky outcrops to admire the view and it was at one of these locations that we chose to take our lunch. 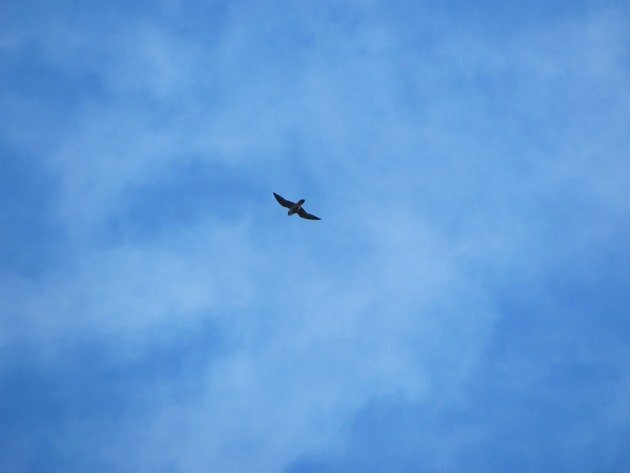 We had only just sat down when a Peregrine Falcon flew out from the cliffs and soared the thermals overhead. Shortly afterwards a White-bellied Sea-Eagle soared overhead and with the sun on our backs it was a perfect place to stop and rest. 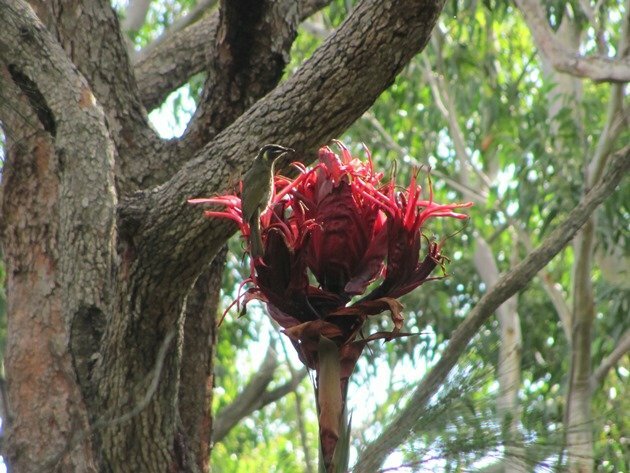 The forest is currently full of flowering Gymea Lilies and they are a native lily that attracts birds to its nectar. It is indigenous to the coastal area of New South Wales and the plants are incredibly tall. The Lewin’s Honeyeaters appeared particularly interested in the nectar on the day that we wandered along the trail. Gymea Lily plant and flower being photographed! You are constantly aware of the mutterings of small birds among the trees and we observed Eastern Spinebills, Striated Thornbills, Silvereyes and various honeyeaters. On a lower level there are White-browed Scrubwrens and Superb Fairy-wrens and keeping an eye on tree trunks you will soon discover White-throated Treecreepers. We did need to spend extra time reacquainting ourselves with the vocal sounds of the local birds after an absence of 12 months, but within a few days you do remember the vocal sounds of individual bird species. One unmistakable bird flew across the track and stopped nearby. There is only one bird that is completely black with a forked tail and that is the Spangled Drongo. They actually head south in the winter months and can be found in the Sydney area from about March/April to September/October. The most exciting bird that we happened across during the walk was one that we had seen before, but not with all of its breeding plumage. 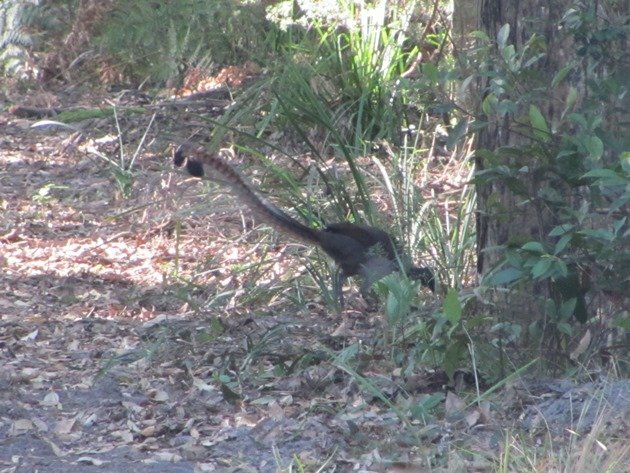 The Superb Lyrebird’s presence was obvious by all of the scratching along the trail and we were listening carefully for the sound of the bird. 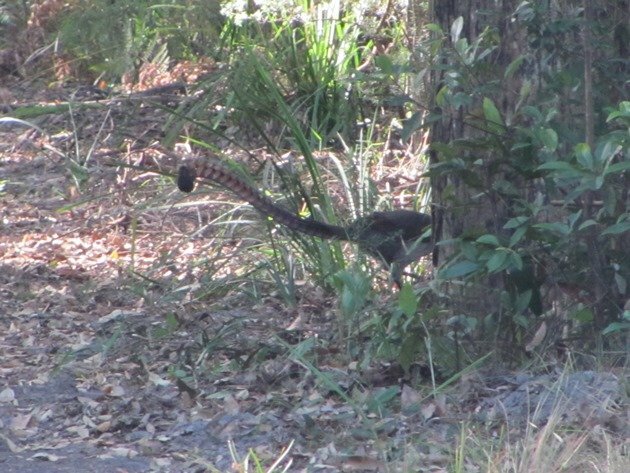 Superb Lyrebirds are incredible mimics and for the next three weeks we often heard the sounds in the forests. 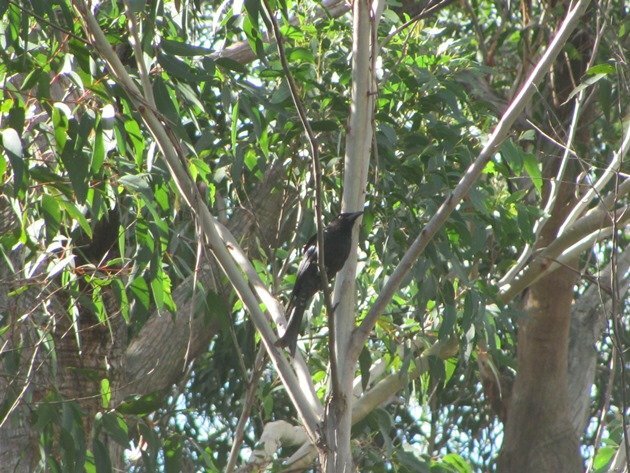 It often started as the vocal sound of the Eastern Whipbird, but before you even thought of writing down that species it had started to mimic another species and this would continue on for several minutes. 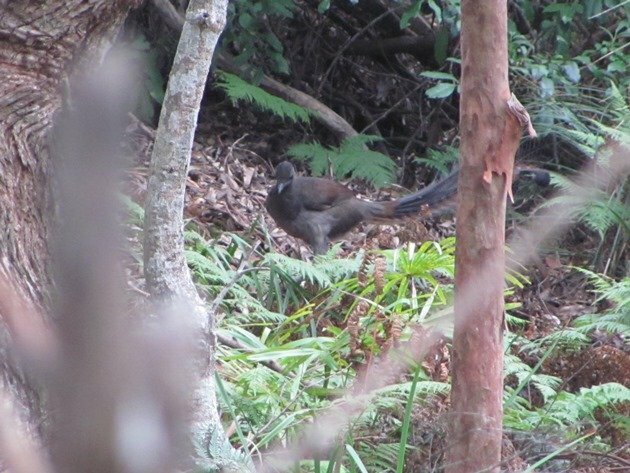 Our first views of a male Superb Lyrebird were of it digging away among the trees throwing leaves in all directions in search of food. The tail was magnificent and it was close to impossible to capture the event due to its fast movement and the ridiculous length of its tail feathers. Further along the trail we were in a section where the trail was somewhat wider and Grant was looking up and I grabbed him to stop him from proceeding forwards. 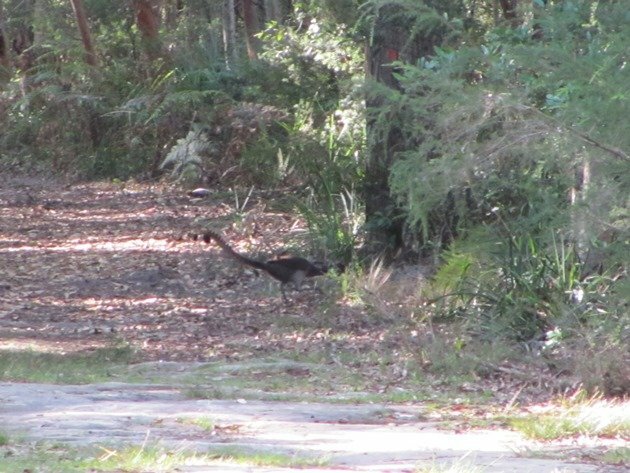 A male Superb Lyrebird was casually walking across the trail and was oblivious to our presence. The tail feathers are incredibly long and I was able to take a few distant photos as it dug around the base of the tree. It is hard to choose how much time you spend observing a species as opposed to photographing a species when the event is so special and often so brief, so please forgive the less than perfect shots of such a magnificent bird!! 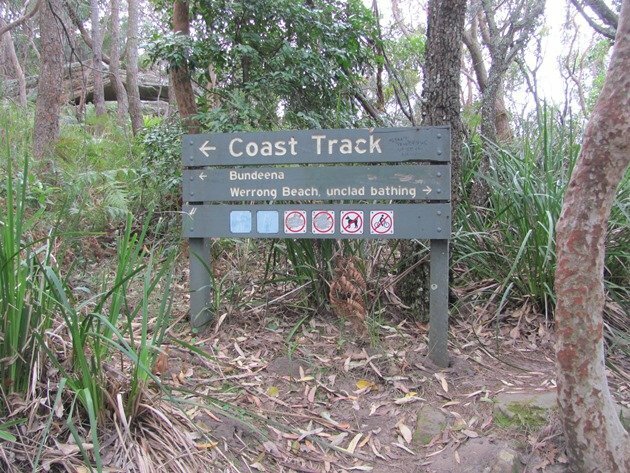 For those of you considering taking this trail during the warmer months there are tracks down to the beaches and if it is really warm you may want to head for Werrong Beach! Although the sign indicates “viewing” and “unclad bathing” I believe they do mean these to be separate issues!! There are no facilities along the length of the trail, so you do need to be self-sufficient. Also don’t put your binoculars away during the last section as you wander through the houses to the Helensburgh train station because there are Satin Bowerbirds, Sulphur-crested Cockatoos, Yellow-tailed Black Cockatoos, Masked Lapwings and more to entice you! Delightful post, I really picked up the mood of being out there, thank you! I loved this post, and seeing that spectacular scenery and reading about those magnificent birds… it felt almost like I was there! Thank you, Clare! Thanks! It was a great start to a great holiday……. As a local who has walked that track many times I would like to say how accurate you were in your description. I would also like to tell your readers of a few of the wonderful species you might have missed. We have King parrots, Yellow-tailed black cockatoos, Spotted catbirds, Satin bowerbirds and at night you might be lucky enough to hear or see a Powerful owl or a Barking owl. This morning at 4:00 I heard the first seasonal call of our migratory Chanel bill. We will be making our way to Broom in the new year. Cheers! Where Are You Birding This Second Weekend of May 2010?